Easy to turn the speaker Upside Down.For keeping access to the controls. * EMATECH have been in the field of TV&Speaker mount bracket/stand for more than 20 years. * We spent 3 years in developing for SONOS Mounts/Stands with our extensive experience. 3.0 out of 5 starsQuick Install. Sturdy. Good Looking. Some design concerns. Installation of this Sonos One bracket was quick and easy. And each wall mount subassembly has its own built in Bubble Level! 😊 See my photo. The wall mount is attractive and sturdy looking. I purchased white for my black Sonos Ones to make it appear visually that they are floating against my white Walls. 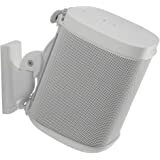 The speaker with attached bracket can readily be removed from the wall mount part by pulling up. It slides right out. The metal components seem quite strong enough for the heavy Sonos One. 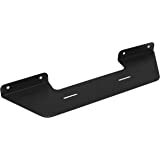 I am not satisfied with the way the brackets hold onto the speaker and believe the speaker could fall out of the wall mount. So I added my own inexpensive cable ties to more confidently secure the speaker since they are expensive, and heavy and they vibrate. Also, the bracket pivots on a hinge to allow the speaker to point downwards. There is a locking screw that controls that pivot hinge and I found it did not adequately control and lock that hinge action. So I used another inexpensive cable tie to secure the speaker and hinge in the full upright position. I have communicated my concerns as an engineer to the seller, and their staff have quickly responded. They have been very communicative and interested in my comments and concerns and are looking into possible improvements. Overall this is a very reasonably priced product. It fits my limited budget. The mounts looks great on the wall with my Sonos Ones. See my photo. 4.0 out of 5 starsWorks well, but please read details in this review. Product was shipped quickly from seller and arrived well packed. This mount had two adapters for two differing types of Sonos Speakers. My application is the Sonos One with Alexa. Came with wall anchors and screws that will suffice. This is a two-piece speaker mount. One piece is mounted to the wall and the other is mounted (squeezed) into the back of the speaker using a screw/plate that tightens down onto the top of the speaker. 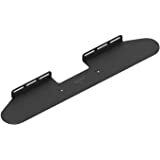 The plate has two rubbery grips that use friction to hold the top from falling out (see picture) Mounting went easy as there is a hidden level inside the wall mount to assist. The speaker part of the mount has a barrel that slips through two rings(one at the top and one at the bottom, and gravity hold it in There is a screw cover that does not match color with the mount if you order a black one. Kinda-cheap if you ask me not to manufacture it with two colors of screw covers!. 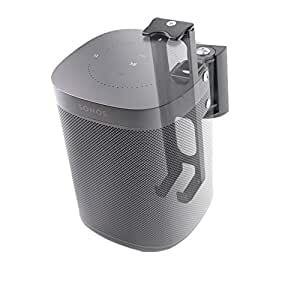 The barrel/hinge type of mount allows for the speaker to swing back and forth without any way to tighten it down so if the power cord pulls a bit it will swing that way always. it should have a way to lock down the barrel so that it can't swing. Overall I would say it works. Ceiling mounting may be an issue because there is no way to lock the barrel. 4.0 out of 5 starsWorks well and solid. Directions are awful. Wish it came in white. 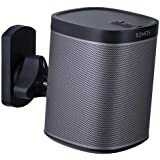 It's really difficult to find a wall mount for a Sonos Play One. Sonos was simply foolish to leave out the bolt hole found on the Play:1. Anyway, this bracket does a good job solving the problem and it's very well made. 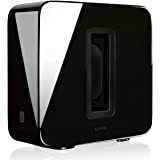 1) It doesn't come in white which is the color of my speaker. 2) The directions were written by someone who speaks no English. Zero. And the translation app used was not a good one. It took me a while to figure out the black plastic cylinder pulls straight out once you remove the large silver bolt. Also, you do need to unscrew the top plate to mount it then properly tighten it onto your speaker. I found out that I had made a mistake. They have two different mount tabs one for Sonos One and the other for Play 1. They look identical at first glance but the Play 1 tab has a slight downward bend to it. 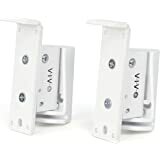 My first review gave this a 1 star because my Play 1 fell out of the bracket due to a failure of the little feet that are only stuck on with light adhesive. I recognize my mistake and move this to a 4, it is still not as strong as some of the other mounts but it does appear to work. 5.0 out of 5 starsSwivels and works with Play:1 and One! 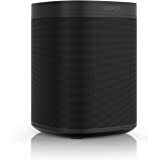 It’s quite simple to install and versatile so you can use it with Sonos Play:1 or One (newer model). Love it!